The Wilson’s disease leads to the accumulation of copper in the liver and other organs. Hepatic or neurological symptoms develop. The diagnosis is based on a low caeruloplasmin, high urinary copper excretion and the results of a liver biopsy. The treatment consists of a low-copper diet and drugs such as penicillamine or trientine. Wilson’s disease is a disorder of copper metabolism that affects men and women; about one of 30,000 people has the disorder. Wilson’s disease patients are homozygous for the mutated recessive gene on chromosome 13. If it is heterozygous ago, which is the case at 1.1% of the population, the disorder remains asymptomatic. The Wilson’s disease leads to the accumulation of copper in the liver and other organs. Hepatic or neurological symptoms develop. The diagnosis is based on a low caeruloplasmin, high urinary copper excretion and the results of a liver biopsy. The treatment consists of a low-copper diet and drugs such as penicillamine or trientine. Wilson’s disease is a disorder of copper metabolism that affects men and women; about one of 30,000 people has the disorder. Wilson’s disease patients are homozygous for the mutated recessive gene on chromosome 13. If it is heterozygous ago, which is the case at 1.1% of the population, the disorder remains asymptomatic. Pathophysiology, The genetic defect in Wilson’s disease, affects the copper transport. The disordered transport diminishes the copper secretion into the bile, leading to a copper overhang and accumulation in the liver, which commences with the birth. The disturbed Transport also engages in the incorporation of copper into the copper protein ceruloplasmin, whereby the caeruloplasmin is lowered. Forming liver fibrosis ultimately causes cirrhosis. Copper diffuses from the liver into the blood and from there into another tissue. It damages the brain most, kidneys and reproductive organs attacks and causes hemolytic anemia. 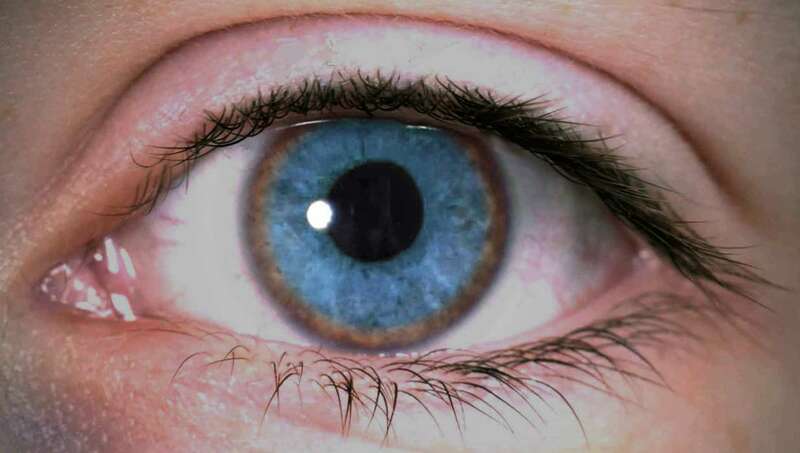 Some copper is deposited around the cornea and the iris edge, whereby the Kayser-Fleischer rings are formed. The rings seem to revolve around the iris. 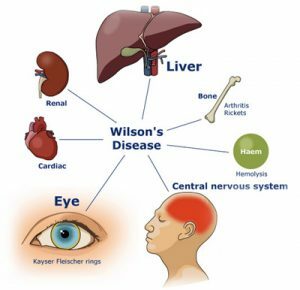 Symptoms and discomfort symptoms of Wilson’s disease usually develop aged between 5 and 35 years but can be seen in aged 2 to 72 years. In almost half of the patients, especially among young people, the first symptom Hepatitis – acute, chronic active or fulminant. However, hepatitis can develop at any time. In about 40% of patients v. a. Young adults, the first symptoms point to a CNS involvement. Motor deficits, as different combinations of tremor, dystonia, dysarthria, dysphagia, chorea, sialorrhoea and incoordination fall on. Partly include cognitive or psychiatric abnormalities to the symptoms of the CNS. 5-10% of patients first notice randomly golden yellow or greenish yellow Kayser-Fleischer rings or sickles due to copper deposits in the cornea, suffer from amenorrhea, recurrent miscarriages or hematuria. Diagnostic slit lamp examination for detection of Kayser-Fleischer rings. Ceruloplasmin and copper excretion in 24-h urine. Sometimes confirmation by penicillamine challenge test or liver biopsy. A suspected Wilson’s disease is under 40 years in individuals with any of the following symptoms: unexplained hepatic, neurologic or psychiatric fault unexplained persistent elevations of hepatic transaminases sibling, parent or cousin with Wilson fulminant hepatitis is a disease Wilson suspects is for the detection of Kayser-Fleischer rings slit-lamp examination required. Also, the Ceruloplasmin- and copper levels and copper excretion are determined in 24-hours with a urine test. The transaminase levels should also be measured frequently; high levels confirm the diagnosis. Kayser-Fleischer rings These rings and the common neurological abnormalities or lowering the Ceruloplasmin are almost pathognomonic of Wilson’s disease. Rarely these rings also occur in other liver diseases (e.g., As biliary atresia, primary biliary cirrhosis), but the caeruloplasmin is then no effect. Ceruloplasmin – The Serum ceruloplasmin value normal 20-5 mg/dl is usually lowered in Wilson’s disease, but may in remain normal. The value can be reduced even in heterozygote carriers and individuals with other liver disorders (eg., Viral hepatitis, drug- or alcohol-induced liver disease). A low caeruloplasmin in a patient with a Kayser-Fleischer ring establishes the diagnosis. A caeruloplasmin less than 5 mg/dl is very suspicious, regardless of the clinical copper serum. The serum copper levels can be high, normal or low-level copper excretion. Located within the urine, Wilson’s disease before, the copper excretion increases in 24-hour urine from the typical maximum value of 30 g / day to about 100 micrograms/day. Are ceruloplasmin low and the urinary copper excretion high, can provide a precise diagnosis. A conflict between the results, measurement of copper excretion after administration of penicillamine (penicillamine challenge test) can confirm the diagnosis. This test is usually not performed in adults, as the cutoff values. Leberbiopsie not well established in unclear cases (eg. As increased transaminases, no Kayser-Fleischer rings, indefinite values for ceruloplasmin and copper excretion in the urine), the asked diagnostics using a liver biopsy, by the hepatic copper concentration is measured. However, the results can by examining errors due to very different copper concentrations in the liver or by resulting in fulminant hepatitis necrosis, the significant amounts of copper releases falsely negative as fallen. Screening in Wilson’s disease, since early treatment is very successful, screening for each is indicated suffer its siblings, cousins, or parents with Wilson’s disease. The screening comprises a slit-lamp examination and determination of transaminases, and Serum copper ceruloplasmin mirrors and the copper excretion in urine over 24 hours. Are anomalous results before, a liver biopsy is performed to determine the copper concentration in the tissue. In infants, the tests should be made only if they are older than a year since the Ceruloplasmin are low in the first months of life. Children under 6 years of age, whose test results are within the normal range should be re-examined 5-10 years later. Genetic tests are being tested. The prognosis for patients with Wilson’s disease is usually good if the disease is not well advanced before starting treatment. Up until the age of 30 years, untreated Wilson’s disease is fatal. Penicillamine therapy or trientine copper restriction diet. Lifetime treatment with low-dose penicillamine, trientine or orally administered zinc A continuous, life-long treatment of Wilson’s disease is imperative, regardless of whether symptoms. A low-copper diet (e.g., As a waiver of beef liver, cashews, black-eyed peas, vegetable juice, clams, mushrooms, and cocoa) and the use of penicillamine, trientine and sometimes oral zinc prevents the copper accumulation. The copper content in drinking water should be checked, and people should be advised to supply any vitamin or mineral supplements that contain copper. Penicillamine is the most commonly used chelating agents, however, has a considerable toxicity (eg., Fever, rash, neutropenia, thrombocytopenia, proteinuria). Cross-reactivity may occur in people with penicillin allergy. Patients are> 5 years all oral doses of 62.5 mg of 6 h every 12 h administered up to 250 mg (250-500 mg/day in 2-4 doses), which slowed to a maximum of 250 mg every 6 h to 750 mg every 12 h (1000 to 1500 mg/day in 2-4 doses) increases. Younger children will receive 10 mg / kg or 6.7 mg / kg three times a day (20 mg / kg / day) p.o. Pyridoxine is taken at a dose of 25 mg once daily with penicillamine. Occasionally, the neurological symptoms are aggravated by taking penicillamine. Trientinhydrochlorid is a treatment alternative to penicillamine. The dose is 375-750 mg p.o. 2 times daily or 250-500 mg at 3 times a day (750-1500 mg/day). 50 mg of zinc acetate, which is taken three times a day orally, can reduce the intestinal copper absorption and prevent the repeated accumulation of copper when a patient penicillamine or Trientinhydrochlorid not tolerate or neurological symptoms shows that cannot be fought with the other active ingredients. Cave: penicillamine or Trientinhydrochlorid must not be taken with zinc, since both agents bind zinc and thus form a connection with no therapeutic effect. A poor long-term compliance is widespread in drug therapy. After therapy of 1-5 years, a lower dose may be drawn for the continuation of drug treatment into consideration. A regular follow-up of an expert on liver disease is advisable. A liver transplant can act lifesaving for patients who are suffering from Wilson’s disease and suffer from acute liver failure or severe refractory hepatic insufficiency. Wilson’s disease is a rare autosomal recessive disorder in which copper accumulates in various organs. The disease manifests itself in childhood or adulthood, usually aged between 5 and 35 years. The signs of the disease could be in individuals with a family history of this disorder or unexplained hepatic, neurological or psychiatric abnormalities (including elevated transaminases). To confirm the diagnosis, the slit-lamp examination is needed for the detection of Kayser-Fleischer rings. Also, the Ceruloplasmin- and copper levels and copper excretion are determined in 24-h urine. Patients are encouraged to follow a low-copper diet and are treated with penicillamine, trientine or, if these drugs should be incompatible or ineffective with oral zinc.